This factual account of the Battle of the Alamo brings more vigorous personalities to life and effects more dramatic contrasts than many of its fictional competitors. 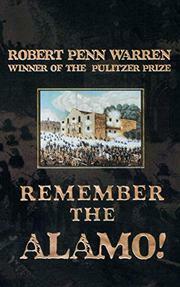 Not only does Robert Penn Warren delineate battle strategies; he clarifies the ambitions and personal histories of the adversaries who met at Bexar and lays bare the stakes for which the battle was fought. The claims and crises of both Mexico and of the American settlers, desperadoes, and outlaws who lived in the no-man's-land state are dissected. Texas, hoping for equal rights in the new Mexico, after Spanish dominion was ousted, was settled 4-1 by ex-Americans. Then American immigration was halted by law -- bringing to an end hopes of prosperity. And the rise of dictator Santa Anna meant an end to hopes for impartial jurisprudence. Boys and girls with any appetite for historical information will endorse this.